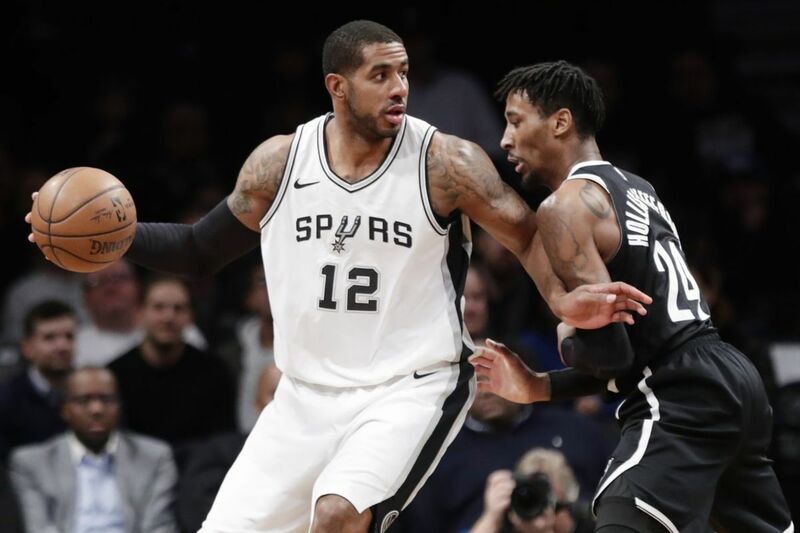 San Antonio’s LaMarcus Aldridge driving against Nets forward (and Chester High grad) Rondae Hollis-Jefferson last week. The Sixers will try to beat the Spurs in San Antonio for the first time since prevailing, 83-77, on Jan. 3, 2004. That would snap a 13-game road skid to the Spurs. Before that 2004 victory, the Sixers had last won in San Antonio on Jan. 8, 1986. 9 Dario Saric PF 6-10 14.0 ppg. 7.0 rpg. 21 Joel Embiid C 7-2 23.7 ppg. 10.9 rpg. 7 Timothe Luwawu-Cabarrot SG 6-6 6.6 ppg. 1.1 apg. 25 Ben Simmons PG 6-10 16.4 ppg. 7.4 apg. Injury report: Markelle Fultz (right shoulder rehabilitation, out); Furkan Korkmaz (Lisfranc fracture, out); JJ Redick (fractured left knee, out); Jerryd Bayless (sore left wrist, questionable). 1 Kyle Anderson SF 6-9 8.1 ppg 6.1 rpg. 12 LaMarcus Aldridge PF 6-9 22.5 ppg. 8.7 rpg. 16 Pau Gasol C 6-11 10.7 ppg. 8.4 rpg. 14 Danny Green SG 6-6 8.6 ppg. 1.8 apg. 5 DeJounte Murray PG 6-5 6.7 ppg. 2.6 apg. The Spurs have a 57-35 series advantage.